How Are Cosmetic Dentist Veneers Different? Cosmetic dentist veneers are really just normal cosmetic veneers, but they are made by a dentist with a special interest in cosmetic dentistry. The main difference between cosmetic dentist veneers and cosmetic veneers from a general dentist is that a cosmetic dentist can change the way your smile looks, whereas normal veneers usually have to blend in with the other teeth. This means that the cosmetic dentist is doing a much more complex job, and must spend much more time carefully planning everything before he starts. Like a lot of things in life, the secret is in the planning! Here are some cosmetic dentist veneers that I did for a young lady before her wedding day.The "before" photos show the problems - uneven tooth sizes, and uneven tooth shapes. 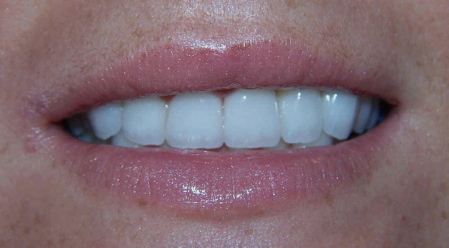 The "after" photo shows what we were able to achieve with 8 veneers on her upper teeth. 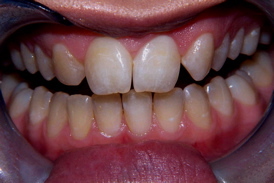 Here in the photos below, is another case where the teeth are very irregular. To be quite honest, the best treatment here would have been orthodontic treatment with braces, but this young lady did not want braces, and so we corrected the crooked teeth with veneers. First of all, the dentist needs to be sure what it is that you don't like about your teeth. He needs to know exactly what you want to improve. So he has a talk with you about that. Usually, we will want to improve the color of the teeth. To get the best results, the teeth should be whitened before veneers are done. This is because veneers are so thin, the underlying tooth color can shine through. So the lighter the teeth are, the better the veneers will look! Next, he will take some photographs of your teeth, from different angles, and take some moulds of your teeth. A few days later he will have the plaster models back from the lab, and he will point out the problems on the models and photos with you, checking that he has understood your concerns. gaps or spaces between the teeth. teeth that look too long or "too square". First, he must decide exactly where the biting edges of the 2 upper front teeth should be. This the key to everything else that follows! Are your current teeth too short or worn down? Too long? Too far back? Once the dentist has decided if the position of the biting edge needs to be moved at all, he can go to the next step. Next, he has to measure how wide your front tooth is. Unless he wants to change the width a bit for some reason, that measurement will dictate how long your tooth should be. For an attractive appearance, the width should normally be 75% - 80% of the length from top (gum edge) to bottom (biting edge). 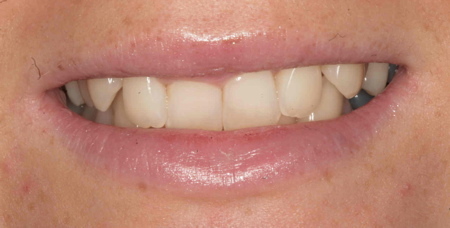 If your front tooth is 8mm wide, then it should be around 10mm from top to bottom. This gives us the 80% rule. If your tooth is shorter than this (for example), then the dentist will need to consider moving the edge of the gum up a little, so that the amount of visible tooth is 10mm. (assuming the width is 8mm). Still with me? So now we know where the biting edge of the 2 upper front teeth should be, and where the gum edge should be. Everything else follows from that - now we have a framework! The dentist then sends your plaster tooth model back to the lab, to get a wax mock-up of how the finished veneers could look. The lab guy will make adjustments to the plaster teeth according to the dentist's instructions. Then he will build up "cosmetic veneers" in tooth-colored wax, to simulate the final result. He will follow a mathematical formula for "attractive teeth" in order to get the correct size and shape of the veneers on either side of the 2 front teeth. Then he sends it back to the dentist, and you get to see what's been done so far! Now you can see the mock-up of the 8 or 10 cosmetic dentist veneers on a model, and hold it next to the original model of your teeth. Now you can see what improvements the dentist and lab have been able to plan. Hopefully, it's a big improvement! Sometimes (not always) it's possible for the dentist to make a small putty mould of the wax mock-up, and fit this over your own teeth. If he puts a little tooth-colored liquid acrylic into the putty mould beforehand, the acrylic sets on your teeth in the shape of the mock-up. Then, when the dentist takes the mould away, you are left with a thin shell of acrylic on your teeth, in the shape of the proposed veneers. Don't worry - it doesn't stick, and peels off really easily. But for 5 minutes or so you get to see an acrylic version of the possible cosmetic veneers on your own teeth! This only works if your teeth are smaller or shorter than you want, and the plan is to build them up a bit. It won't work if your teeth need to be reduced in size at all for the final veneers. But you still get to see the models! After the planning stage, the actual treatment will be similar to a general dentist. 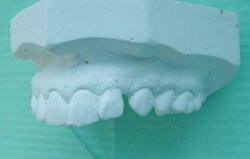 The temporary veneers can be made using the mould of the mock-up, so you get a "trial run" with the shape and size of the veneers before the permanent ones are finalized. You can make small changes at this stage, if you want to change anything. As you can see, cosmetic dentist veneers can take several appointments in planning before you even decide whether you want to go ahead or not. But the end result is definitely worth it! 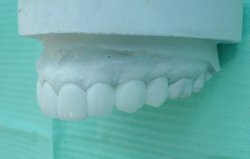 The lab guy has had a "trial run" at making your veneers, and has a chance to sort out any little problems that may have been overlooked in the early stages. When you get your new cosmetic dentist veneers, you'll want to look after them to keep them looking their best, and protect your investment. The most important thing is to keep them clean, especially along the gum edge where the veneers meet the gum. The best way to do this is with a good quality sonic toothbrush such as the Cybersonic 3 (read a review of this toothbrush). This brush will get the plaque bacteria off the veneers without any harsh vibration. Definitely a "must do" when it comes to maintaining your veneers! And you can get the Cybersonic toothbrush at HALF PRICE if you get my special discount code on the review page). With any cosmetic dentist, veneers are probably what he does best. Just give him plenty of time to plan everything out, and don't be in a rush to get your new cosmetic veneers fitted!